This is NOT the same 2011-14 Vortech kit you see for sale all over the internet. 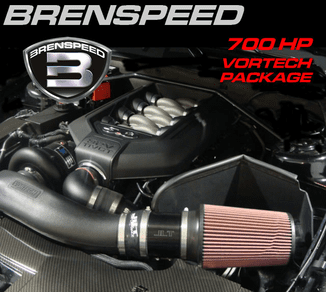 The Brenspeed Vortech 700HP supercharger package is a complete turn key kit that includes everything you need to make 700 flywheel horsepower!! Thats right, we said 700 flywheel horse power. Not only will you get the high quality V-3 Vortech Si-Trim centrifugal supercharger kit with air-to-air inter cooler, you get a huge JLT 110mm cold air intake, Kenny Bell 40 amp Boost-A-Pump, a set of NGK one step colder spark plugs, and a SCT X4 tuner loaded with a Brenspeed Custom Calibration in either 93 or 91 octane. 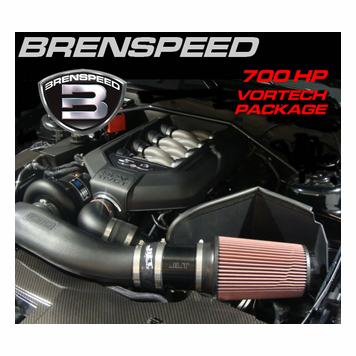 This complete Brenspeed system will boost your stock 2011 GT to 700 HP* and 577 lb/ft* torque with 8.5-9.5 PSI at redline. All without a pulley change. The supercharger unit is also available in Black Finish, or Polished Finish for an additional $273.22. Please select your upgrade finish from the drop down list above. Welded air/air inter cooler. 24" x 13" x 3.5" cooler core. * This kit was tested on Brenspeed's 2011 Engineering Mustang GT with Kooks Long Tube Headers and Catted H Pipe which netted 728HP; an estimated 700HP with stock exhaust is expected.